One of Europe’s the most important train stations is also the youngest of Paris. In 1900 France’s capital is preparing for the World Expo and is busy building: the Grand Palais, the Petit Palais, the bridge Alexandre III and the Gare d‘Orsay. The railway company PLM seizes the opportunity to offers itself the Gare de Lyon – a proud magnificent building in the Belle-Epoque style. A monument of railway architecture with a 100-meter-long facade, decorated with allegories and a 64-meter-high clock tower. A copy of London’s Big Ben. Inside the station a splendid restaurant, „Le Train Bleu“. Two marble stairs lead to an impressive dining room ornate with 41 painting by 30 different artists – the elite painters of their time. They immortalized France’s most beautiful landscapes. The PLM owned the biggest railway network in the world. 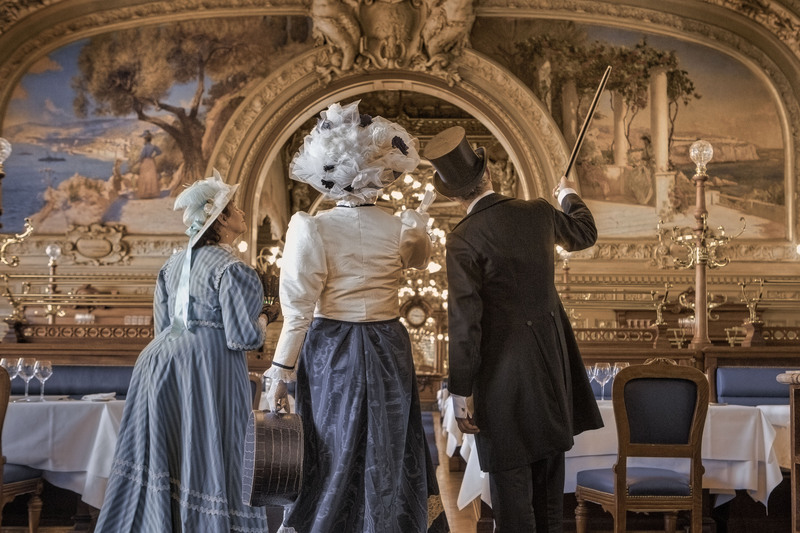 With the Gare de Lyon it celebrated its own empire and showed off its luxurious image. Not far away from the station stands the Gare du Nord. Another stop of the „Train Bleu“ carriages on their way to Cannes. Second oldest and biggest train station of Paris. 23 statues made by well-known sculptors decorate the 180 meters long facade. From Paris you also get to Nantes – home town of Jules Verne. Filmmaker Jeremy JP Fekete traveled to the city close to the Atlantic ocean to the big hangars of „Ile de Nantes“, where a group of fantastic builders set up their workshop. There, where not so long-ago ships were built, now surprisingly alive-looking and impressively monumental mechanical animals are brought to life.